Mount Fuji, or Fuji-san in Japanese, is actually comprised of several overlapping volcanoes that began erupting in the Pleistocene Epoch (1.8 million to approximately 10,000 years ago). The currently active volcano, known as Younger Fuji, began forming approximately 11,000 to 8,000 years ago. 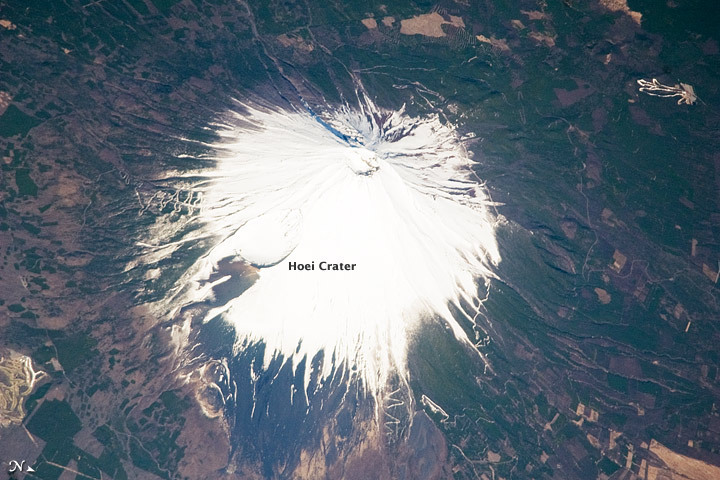 The most recent explosive activity occurred in 1707, creating Hoei Crater on the southeastern flank of the volcano (image center). 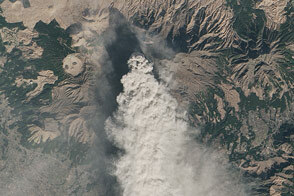 This eruption deposited ash on Edo (present-day Tokyo), 95 kilometers (59 miles) to the northeast. No further eruptions have occurred at Mount Fuji, but steam was observed at the summit from 1780–1820, and the volcano is considered active. This oblique (viewed at an angle, rather than straight down) astronaut photograph illustrates the snow-covered southeastern flank of the volcano. The northeastern flank is visible in this image. The Shuttle Radar Topographic Mission provided an image of the topography of Mt. Fuji and its surroundings. Astronaut photograph ISS019-E-5286 was acquired on April 8, 2009, with a Nikon D3 digital camera fitted with an 800 mm lens, and is provided by the ISS Crew Earth Observations experiment and Image Science & Analysis Laboratory, Johnson Space Center. The image was taken by the Expedition 19 crew. The image in this article has been cropped and enhanced to improve contrast. Lens artifacts have been removed. The International Space Station Program supports the laboratory to help astronauts take pictures of Earth that will be of the greatest value to scientists and the public, and to make those images freely available on the Internet. Additional images taken by astronauts and cosmonauts can be viewed at the NASA/JSC Gateway to Astronaut Photography of Earth. Caption by William L. Stefanov,NASA-JSC. The snow-covered southeastern flank of Mount Fuji Volcano appears in this astronaut photograph from April 8, 2009.